Our first giveaway is finally here! And it's International so everybody's welcome! Sorry for the delay but we've had some family stuff to deal with and didn't have to time to organize this properly until now. Wow, kudos to all bloggers who have had contests because this is a lot of work. We tried to have an eclectic group and the good news is that you can have a say in what books we include! AND WE'LL ADD MORE WINNERS! - Then for every additional 25 followers that are added after that, we'll add two more books and 2 more winners. For instance - at 75 Followers, we'll have First, Second and Third place, plus 2 winners of one book each. The bottom line is that as more people enter, more people have a chance to win more books! There are lots of ways to rack up entries and thanks to Froggy who gave us the heads up about how to do it you can. 1) You must fill out the form (required items are noted). 2) You Must Be a Follower (old or new). You can sign-up easily on the right sidebar. 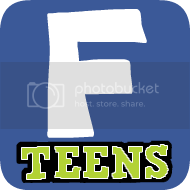 4) Comment on this Post. Anything will do but if you have a book you'd like us to add to this Giveaway, please tell us in the comments here. No guarantees but we will add one or more books based on the voting, so give us your input! (Just keep in mind it must be something available by the end of this giveaway. 5) Contest ends at midnight PST on November 15, 2009. 1) Most are listed on the ENTRY FORM. They include posting, and various ways to advertise the contest. 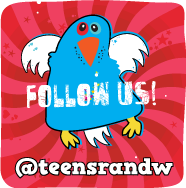 FYI we're on Twitter as @teensrandw. First, second and third place winners get to choose their books and will have 48 hours to respond before we offer the prize to the next winner. The remaining winners will either get a book pulled randomly out of a grab bag or we may give them a chance to choose depending on how many entries we have. We'll decide at the end of the contest. Remember, it's international so spread the word and GOOD LUCK to ALL!! We are so happy with our fast and furious response! We made it to 75 followers in 24 hours. Yes we are adding them all to the list! Yee hah! Thanks everyone and we'll have more additions when we reach 125 Followers! Thanks to all our participants and we promise to add Fire by Kristen Cashore when we hit 150 Followers! Thanks to everyone and Good Luck! We'll add more books and winners at 200 Followers! Thanks to all our participants and we'll add more books and winners when we hit 225 Followers! Don't know what else we'll add yet but at least one more book and were headed to 250 so stay tuned. And we're now up to 17 winners! Thanks everyone! There are now 19 winners so keep it up and good luck! Congrats! I filled out my form. The book I am currently dying for is Intertwined, My Soul To Take and LA Candy. Thanks - I'm going to fill out the form right now! I've been wanting to read Wicked Lovely. I've heard such good things about it, I'll hopefully get around to it eventually. Great contest and a great way to get new followers! I may have to borrow this idea in the future. I've been a lurking follower for a little while. I thought this was as good a time as any to start commenting. Love the blog and am very impressed with the giveaway. I would love to see Sea Glass by Maria Snyder added. Storm Glass was so good! Hmm...books at the top of my to buy list right now are Intertwined by Gena Showalter and Hush Hush by Becca Fitzpatrick. Congrats on your first contest. Filled out the form. I follow you at Black-Eyed Susan's. Congrats on your first giveaway! I try and do at least one a week! I would love to own Hush,Hush. I have read the ARC but I want the final copy since it is different and hardback! Don't you just love the form Froggy uses? I had to use one to! Thank goodness we work together on one blog so she keeps getting bugged by me with all that cool stuff! You have a great selection of books already listed. would love to win any of them, so off to fill out the form. Commenting because this is an excellent contest! Awesome contest! Good luck with the followers, I tweeted my bootie off, hope it helps. I would love to see Catching Fire and As You Wish by Jackson Pearce added to the loot! Such an awesome contest! I can't believe how many books you're giving away! Postage is going to cost a bomb, won't it? I request City of Ashes by Cassandra Clare or Eyes Like Stars by Lisa Mantchev! Ooh, great stuff. There are some books on here I've read and loved and wish I owned, and there are some I've been wanting to read for awhile. What an amazing contest and congrats on all of your followers!!! You will get many more cuz' you have a wonderful blog! Fantastic contest, lots of great choices! I commented on A Circle Of Souls. This contest is awesome. Thank you for making it international! Hmm another book could be "As You Wish"! You could add HOLD STILL by Nina LaCour.... it looks amazing! Another book you could add is Catching Fire... LOVE that book! I've been wanting to read Circle of Souls for a long time! Thanks for such a great contest! What an amazing giveaway! Thanks. Great giveaway. I see a bunch I would love to read! This is an awesome giveaway!! Thanks for running it..
Wow, such an awesome contest! This is great. I am so entering now! My book suggestion: Perfect Chemistry by Simone Elkeles. I so want to read this! Yay! What an awesome giveaway! I also am going to suggest Perfect Chemistry! Wow, what a great contest! Count me in! There are several FABULOUS titles in there (a few I have, a few I want...)...can't wait to see what's added as your followers grow! Great contest guys! I filled out the form! Awesome contest... Great choice in books I'd love to read Shiver and Marked. P.C Cast is a great author. Uh-oh! I know I entered via form but somehow I didn't leave a comment. I need Marked to have the entire collection and I want it because I want to re-read them! Hi guys! Good luck on your contest! I hope you get a lot of new followers, you deserve it. Great contest! I'm a follower now! What a great contest! I would like to see Fire or Graceling added. Thanks for the chance to win! I filled out the form and I'm now a follower. How could I not be? I agree also that you should add either Fire or Graceling to this awesome list!! I love that you used a google spreadsheet for the contest! I need to learn how to use those. Great contest! This is such a great contest. Absolutely awesome contest and you have a wonderful blog so I'm sure the followers will pour in!! This is so exciting...thanks for making it international!!! I've filled out the form, and I am now a follower. Thanks for making it an international contest! Great contest! I'm so happy it is international! I've just filled out the form, a very good idea BTW its very easy and fast! wow, this is truly a megacontest! thanks so much for making this international! All the books there look great, I've got several of them on my wishlist. There are several books I've been really wanting to read. Wow, awesome contest, I am super impressed and would love to join in your festivities! I would add more of the PC Cast books -- can't go wrong there! Great giveaway. Filling out the form now. And many congrats on getting so many new followers! What a GREAT contest! I really wish I could read Hush, Hush! Awesome contest! I'm signing up for sure. Thamks for the giveaway! I am a new follower! Sounds great! I'm headed to the form right now! Fantastic contest! So many good books. I am crossing my fingers for Circle of the Souls. What a great contest! I'm a new follower. I'm a new follower, glad I found you guys! thanks so much! i love to read and this will be so nice to be able to read! What a awesome giveaway!! Thank you for letting me be part of it!! What a great way to introduce someone to your website. Books....oh man, Hush Hush and Leviathan are 2 I really want right now! Oh.. wow.. what a lovely giveaway:-) I'm a follower and now heading over to fill the form.. thank you and blessings. I'm following your blog, and will be filling out the form shortly. I would really like to read Unwind by Neal Shusterman, so that would be my request for a book to add if possible. Hush Hush and Leviathan are 2 that both my son and I would like to read. Great contest. I have some at my website sometimes, stop by and check it out! I'm a new follower - love your blog and glad I found it. This is a great giveaway! Well, I'm in. A new follower too! As for what to include: How about that new teen science fiction book by Scott Westerfeld (Risen Empire or whatever it is)? I'd like to see that. I really want to win Shiver! I would love to have any of the Vampire academy books added to the list. I have read them all on a book reader, but I'd love the paperbacks! I'm off to do the form! Thanks again! Please count me in! And thank you for hosting this fun contest!! And, of course, filled in your form. I gave you a different email add at the form. The one below will be discontinued as soon as it receives too many spam. WOW! What a great giveaway! Thanks so much! Great contest! Such a great assortment of books. Thanks for hosting this giveaway! This is an excellent contest! I'm happy to enter and share the info on Twitter. Thanks to L8BloomerOnline I saw on Twitter that this giveaway was going on. Glad for the chance to enter. As far as any other books to add to the pile...anything related to Jane Austen would be great. And "Sepulchre" by Kate Mosse, too. Thanks for the chance to enter it. Amazing contest and congrats on the new followers - I look forward to reading more of your blog. Wow!! This is such an amazing contest. I'm a new follower, but I'm looking back through some old posts and I definitely think I'm going to like this blog. If I could pick any book to add to the pile, it would be Candor by Pam Bachorz. Awesome contest. If I could add to the list I would add Fade or Wake. Awesome contest! Please enter me! I am a blog follower. What an awesome site and giveaway! Filling out the form now! Wow, amazing! I'm SO filling out the form!!! Me too, love the idea. What a great contest. I would add a book but the only one I can think of is already on your list, Shiver. Oh wait, how about Rampant?? Ok I feel like I already entered but I don't see my name! Sorry if I did!!!! Uhm, you already have alot of amazing books up, but if you do add more maybe The Luxe, or Leviathan? Just putting it out there. Oh you guys, this is so cool! Congrats! I'm so excited for you! I filled out the form, so we'll see what happens! I would love to win any of these beautiful books! This is such a generous contest! Thanks so much for the entry. Great contest- would love to see Bran Hambric & the Farfield Curse added. Awesome giveaway! A book I would suggest to be added would be Rampant by Diana Peterfreund. I'm a little late in the game but glad I made it over. Great contest! Good Luck! Thank you for offering this contest. I filled out the form. What a fabulous giveaway - thanks! Amazing giveaway, thanks! I filled out the form too. This is a great give away and you have a wonderful selection of books. I think all of them are on my wish list! I've begun to follow and I filled out your entry form. Now I sit back and keep my fingers crossed. Thanks for the great giveaway! Congrats on all the followers! I am a new follower. Great Blog! This is an amazing contest and looks really successful as well. This is such an awesome contest. I have never seen so many great books in one giveaway. This contest looks really awesome! I really love all the books you're offering! Some of them I've been dying to get forever. Sent out my form last night! For future book selections I suggest The Book Thief, The Giver, The Perks of Being a Wallflower, and The Boy in the Striped Pajamas. This sounds like an absolutely awesome contest with some spectacular books! I’m going to enter. SHOOT! Sorry, just realized that you've already entered Possessions by Nancy Holder into your contest! alrighy! GREAT contest! Thanks for hosting!! It's to hard to pick, there's so many great books out right now! I think you can add ghostgirl! I would like you add "Fallen" . Great contest and congratulations for having 222 followers! My choice would be Marked, Hush Hush or Candor. I second estereta on Hush Hush. What a FUN FUN contest - wow! Awesome! I still think adding Twilight and/or New Moon (the movie-related covers of the books) is a good idea, considering that the New Moon one is kind of new. That's one mega awesome book contest! I would love to see any of the Blue Bloods Series. The Van Alen Legacy was just released. Sea glass,Sea of Monsters by Rick Riordan,Catching Fire by Suzanne Collins, My Soul to Take by Rachel Vincent are totally cool ! Dang girls your doing great. Congrats on all the followers. Keeping my fingers crossed you got an awesome selction up there. I'm already a follower and I'll go fill out the forum now!! WOW! What a wonderful contest!! And there are SOOO many good authors in there! I love Maggie Steifvater! And Becca Fitzgerald.... Can not wait for the second installments on Shiver and Hush Hush!! And the book "Son of a Witch"? That is a really good book! I'm a new follower! And oh so glad I ran across your site! Ooooo!!! Very interesting contest. I hope to win. The book I would like for you to add is 'The Den os Shadows Quartet' by Amelia Atwater-Rhodes. Hi! New to this forum. Great contest! I'm here from an email from enation. I am now a Member of your Blog. You have a nice Blog site! This is an awesome contest. It's great that you're adding more books to have more winners! Wow! this is some contest! I've filled out the form. Yay! This contest is amazing! Thanks you guys! WOW, this is just so great! Thank you! Squeee!!! I hope I win!! How rad is this contest?! I filled out the form. I would follow you on Twitter, but I can't see where your username is.